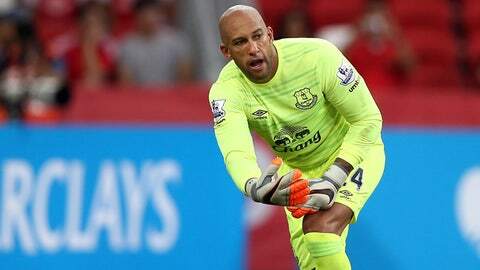 Veteran goalkeeper Tim Howard is now second choice at Everton, according to Toffees manager Roberto Martinez. Everton manager Roberto Martinez confirmed United States goalkeeper Tim Howard is expected to serve as the backup to Joel Robles moving forward. Martinez planned to start Robles in the FA Cup anyway, but the manager faced a decision about whether to retain him for Premier League matches after Robles made an error on Salomon Rondon’s goal last weekend and Howard returned to full fitness. The Toffees manager outlined his support for Robles ahead of the FA Cup fifth-round tie against Bournemouth on Saturday (live, 12:00p.m. ET, FS2, FOX Sports GO) and said the Spanish goalkeeper is now his first-choice in the position. “It’s been a really good, consistent period for him and the back four,” Martinez told reporters in a press conference on Friday. “I think defensively, you look at the performance against West Brom and it’s exactly what we expected. We only conceded one corner, one shot on target, and unfortunately that went in. To have three clean sheets before that is something we can build on and carry on those lines. "That’s when you are in a strong position, when you’ve got football making the decisions,” Martinez continued. “It’s important that you give continuity and at the moment, Joel is doing really well. But Tim Howard has been injured and he hasn’t been able to fight for his place back. We’ll benefit from the competition for places and that’s the way I want to see it." The decision places Howard in a reserve role for the first time since joining Everton ahead of the 2006/07 season. The 36-year-old goalkeeper came in for withering criticism earlier in the season, but he returned to form with a sterling display against Manchester City in the Christmas period before picking up the knee complaint. Howard’s murky future with the club — including a potential return to MLS this summer — does not factor into the consideration at the moment, according to Martinez. Martinez’s verdict complicates the considerations for U.S. coach Jurgen Klinsmann prior to a pair of World Cup qualifiers against Guatemala next month. Howard and Aston Villa goalkeeper Brad Guzan are the two primary options in goal. Klinsmann said last year he planned to rotate matches between Guzan and Howard to keep them engaged at the international level. Both players, however, are now out of their respective teams for the foreseeable future. Klinsmann told the Washington Post this week that he planned to monitor their situations carefully and weigh the potential fallout from those selection decisions as the qualifiers approached.